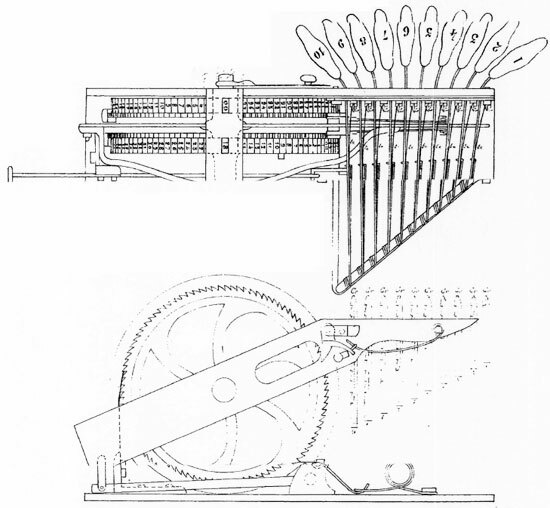 The french inventor Alexis Petetin from Besançon (Doubs), is a holder of two french patents (№110349, 27 Nov. 1875 and №163925, 27 April 1884) and one german patent (№32148, 24 Jan. 1885) for adding machines. Almost nothing is known about the inventor. Alexis Auguste Petetin was born on 23 November, 1826, and died after 1890. He was a luthier and merchant, and in 1870s and 1880s he lived in Besançon, Rue Moncey 7. He was married to Marie Othilie Deland (1826-24.01.1890) and they had a daughter—Marie Cécile Petetin (1856-after 1886). 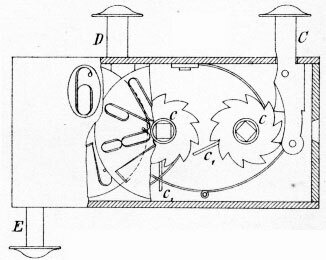 The first machine of Petetin, Additionneur mécanique (see the lower patent drawing) is a large 10-keys one-column adder with two 100 teeth result wheels. The device featured a simple and reliable construction and can be used for sums up to 9999. The second patent of Petetin is for a small three keys pocket adder (Additionneur de poche à trois touches) and it seems it is the first device of this kind in the history of mechanical calculators. The button C (see the lower drawing) is used for entering units, button D is for tens, and button E is for hundreds. The tens carry mechanism if implemented by means of a resilient shaft c1, which meshes to the next ratchet wheel during the carry. This simple device can be used only for simple adding operations up to 999. The disadvantage is that wheels are always shifted by only one tooth while pressing a button, so a button should be pressed as many times as the sum of corresponding digits.